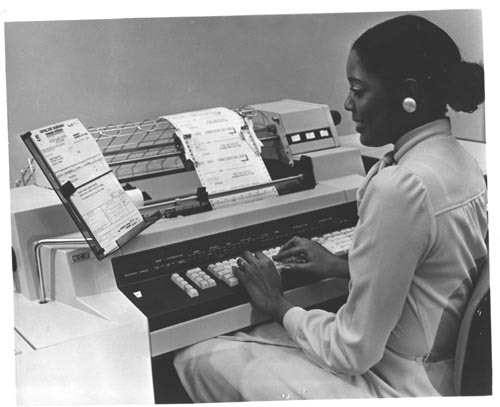 B&W image of woman intering data into NCR 499 . "Operator can enter data using the standard keyboard on new NCR 499 data processing system. Optional continous-forms feeder automatically feeds, holds and spaces continuous forms such as checks, statements and journals. The system can accommodate two feeders where a high volume of printing is needed. With a variety of options and features, the system can be tailored to the individual user's needs and expanded as the user's requirements grow."